A long time ago, the Pharaoh Anopheles was cursed. Since then, his mummy has restlessly roamed the dark corridors of the pyramid, scaring away anyone who dares intrude. He has obstructed the path to the burial chamber with traps and boulders. 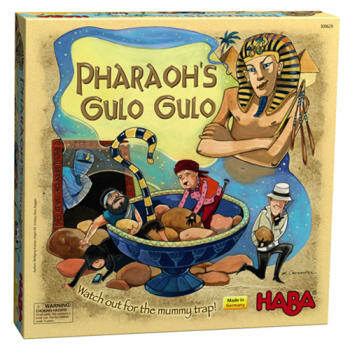 Throughout the game, you must demonstrate your skill at evading the mummy trap! You may only continue ahead towards the burial chamber when you successfully remove a wooden boulder in the corresponding color of the space you want to reach, without allowing the Pharaoh's staff or another boulder to fall out. If you can do this, then you have deftly escaped the mummy's attention. But woe is he or she who attracts the wrath of the cursed mummy for they will quickly find themselves right back at the pyramid entrance. Will you be the first to reach the Pharaoh's sarcophagus and free the mummy of the curse? An exciting dexterity adventure for 2-6 players, ages 7-99 but also includes a variation for younger players 5+.